Two books I read this year dealt with the complexities of Bible translation. 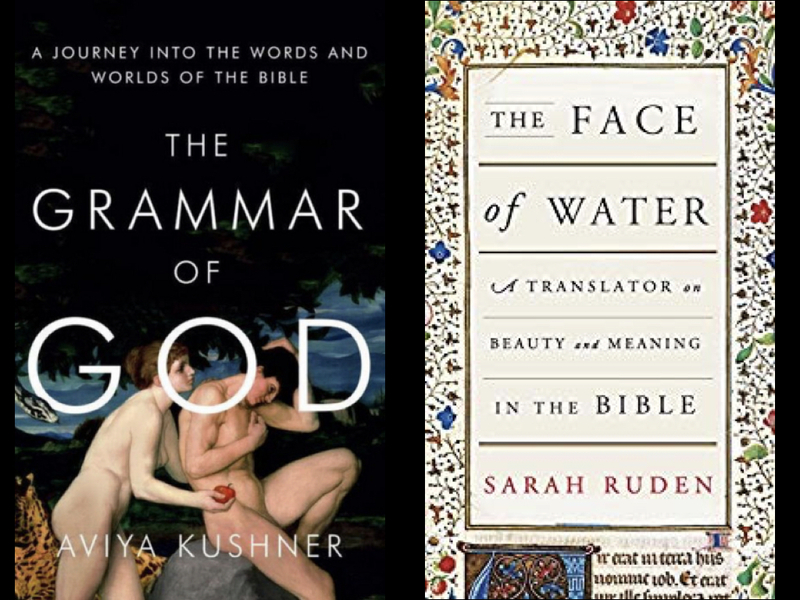 This summer, I read The Grammar of God: A Journey into the Words and Worlds of the Bible by Aviya Kushner (New York: Spiegel & Grau, 2015) and this past week I finished Sarah Ruden’s The Face of Water: A Translator on Beauty and Meaning in the Bible (New York: Pantheon Books, 2017). Both books are excellent and offer insight into the difficulty of translating Hebrew into English. It’s somewhat unsettling to learn how complicated this is and how much choice is involved. The few years of Spanish I took in middle school made it seem like the only challenge in the translation process is that you need to know some grammar and vocabulary, but that otherwise it’s relatively uncomplicated and straight-forward, a matter of time more than anything else. “I want coffee with milk, please,” becomes “Yo quiero café con leche, por favor.” Word-for-word. Simple, really. This is not how you translate the Bible. The Hebrew of the Hebrew Scriptures is a different affair because the Hebrew language comes from a different world. For starters, we’re translating across and not within language groups and doing so across time. The language of the Hebrew Bible has been compared to lego building blocks, so that while the opening line of Psalm 23 in English is nine words (“The Lord is my shepherd; I shall not want” is how the King James presents it), in Hebrew it’s four building blocks, literally, “Yahweh | pasturing-me | not | I-will-go-without.” Further, these bricks of text are made up of only consonants, and so “vowels—dots and dashes located above, beneath, and inside letters—[which] frequently determine meaning” (Kushner), must be added as you read or translate. So what do you do about this challenge of bringing the Bible into the modern world? The mindsets of the two authors separates these books. The discussion that accompanies the text of the Hebrew Bible is forsaken in translation. This is to say that not only is there a Hebrew text, but there is Hebrew commentary on the text. This gets alluded to in the New Testament. In Luke 4:16–30, Jesus did what other Jews in synagogue did. He read a passage, in this case one from Isaiah. But at the time he was, as I understand it, supposed to comment on the passage by referring to what various rabbis said about it, Jesus upends the whole thing by saying that his life was all the commentary needed. He was the fulfillment of the text. “When I first bought the Oxford Annotated bible, the first English-language Bible I ever owned, I carried it around in a brown paper bag. I grew up with the concept of marit ayin, or how things look to the eye, meaning the naked eye; for example, a person who keeps kosher might not go into a burger joint to buy a coffee, even though black coffee is definitely kosher. Walking around with the Old and New Testament doesn’t look like a Jewish activity; it looks suspiciously unkosher. A person passing by might not understand. The first place I went in Iowa City with my brown paper bag happened to be Hillel, the Jewish student center, and an older man I met there, who saw the Oxford peeking out—we were both volunteering our time—commented that he was sure I had better things to do than to read the Torah in a Christian translation. Ruden is a translator of ancient languages who decided she wanted to learn to read and translate ancient Hebrew, a language where she had no expertise, because she came to a point where she learned that the Bible “was a book that profoundly mattered, more even than ancient pagan literature,” an area where she has some significant competences in translating. The name of God is a subject in both books. But while Ruden routinely uses the name Yahweh to refer to the name of God, Kushner says, “No one I know from the Jewish community says Yahweh.” Interesting how point-of-view or, perhaps better, point of origin with its traditions, determines how you approach the task of translation. I will never go without. He will not fail to guide me to a lace of rest, where the water is at peace. 3. He will bring my life back to me. He will lead me along wagon-tracks of fair dealing—he would not be who he is if he did otherwise. Because of you, you there with me. Your weapon and your crook—I see them, and I know I am safe. 5. You arrange a feast on a table where I sit, though my enemies loom on the other side. You refresh my head by bathing it in oil; you will my cup again. It’s worth noting that Ruden’s translation of this psalm also includes three footnotes to explain choices she made. Among the thing I really enjoyed about Ruden’s book is the way her personality came through. She is funny and quirky (in the best possible sense). 2. The translator inevitably influences the translation. 3. There is often more than one way to express something in English. 4. There is great value living in the company of commentators. What I take away from the experience of reading these two books is that I need to be a little less uptight about whatever particular translation I have in front of my eyes and recognize that while there are parts of the Bible that may be perfectly clear, there are others where reasonable people will come to different conclusions as to its meaning. Some care is called for before and when we say, “The Bible says.” Unless (or, I suppose even if) I learn Hebrew, there is value in reading many translations. Both writers stress the importance of dialogue. The Bible is a book we talk about. What we say about scripture is in no way as important as the scripture itself, but perhaps talking about scripture is the best way to understand it. The need for and value in preaching is the ability to bring insight and understanding to explain what an ancient text means today.